Line 5 is a 66-year-old pipeline that carries oil from Wisconsin to Ontario, including the Straits of Mackinac near the Mackinac Bridge. LANSING — A political clash over Enbridge Energy’s plan to build a tunnel around its Line 5 oil pipeline could result in the state suing itself, Senate Majority Leader Mike Shirkey told Bridge Magazine. The Clarklake Republican said the GOP-controlled Senate will make sure the Mackinac Straits Corridor Authority, the board that approved Enbridge Energy’s plan to build a tunnel beneath the Straits of Mackinac, has the resources to make the case for its existence in court if necessary. Shirkey’s comments Friday came one day after Gov. Gretchen Whitmer ordered state agencies to halt action on the tunnel project. Whitmer’s order followed a legal opinion from Attorney General Dana Nesssel, a fellow Democrat, calling the 2018 law creating the Corridor Authority unconstitutional. Speaking to Bridge, Shirkey called Nessel’s move “shameful,” and he defended Republicans’ lightning-quick approval of the tunnel plan in December, which critics have called poorly vetted. Shirkey also lamented former Gov. Rick Snyder’s veto of legislation to allow lawmakers to intervene in some state lawsuits. Shirkey suggested such power would be useful if the Line 5 tunnel issue goes to court. Enbridge, backed by Republican leaders, wants to encase the 66-year-old pipeline in a $350 million to $500 million tunnel below 100 feet of bedrock. 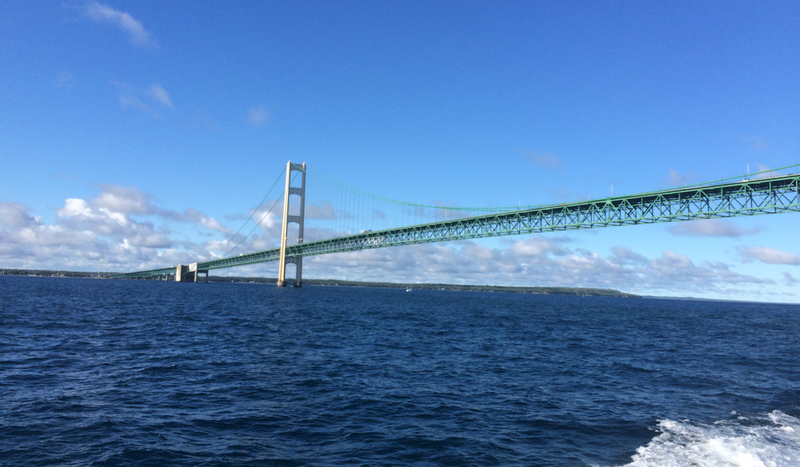 Proponents say that’s the best bet for protecting the Straits from an unlikely spill without disrupting the path of light crude oil from Superior, Wisc., to Sarnia, Ont. Environmentalists call the plan too risky, and the pipeline unnecessary. They want it shut down. The following is a condensed transcript of Shirkey’s conversation with Bridge, lightly edited for clarity. Bridge: You have hinted at the possibility of litigation — and the idea that the Corridor Authority could defend its actions. Do you expect the board to file a lawsuit? What would that process look like? Shirkey: The board is authorized to do such. I am not in a position to encourage them to do so, I’m just making it abundantly clear that it was considered in the statute, and make sure that the board knows it has that option. Bridge: Just to understand the process: The governor has basically halted all action on the tunnel — because her administration is responsible for issuing permits and the like. And the Corridor Authority could file a lawsuit to restart the project? Shirkey: That is my understanding, but I am not an attorney. This is going to become complex immediately. It’s shameful in my mind that we have an attorney general who consistently tries — and very effectively, quite frankly — seeks and finds ways to upset what has been passed into law. Bridge: Attorney General Nessel’s opinion came out less than an hour before Gov. Whitmer announced her directive. That type of dual decision-making didn’t happen much under the previous administration. What do you make of that? Shirkey: I will allow any observer to make their own conclusion. But to me, it’s apparent that there’s — if not coordination, there’s some complicity in this. Bridge: If there is coordination or complicity, is that a problem, or is that to be expected from two officials in the same political party? Shirkey: Well, it's a challenge to be managed, I guess. The voters have spoken. I believe voters are always right, regardless of whether I agree with the outcomes or not. It appears to me we’ll be faced with this reality for a few years. Bridge: So presumably, we could see another instance of the state suing itself? Shirkey: I lament the fact that [Snyder] chose to veto a law allowing the Legislature to defend itself in such occurrences. His veto letter said Michigan had no history of such actions, therefore he didn’t see it as warranted. I wonder if he’d say the same thing today. Bridge: A key criticism of the tunnel plan is that it was written, re-written and approved so quickly during last year’s frantic lame duck session. Some lawmakers — and frankly reporters like me — barely had time to read it and understand it before it was passed. What’s your response? Shirkey: The concept [of the tunnel plan] had been worked on for many months in excruciating detail. But I also admit that it’s not unusual, unfortunately, that legislation after the fact, finds itself wanting for corrections or fixing of unintentional problems — all of which, the Legislature would be happy to engage in. But it’s apparent to me is that the objective [from Whitmer and Nessel] is just to kill it. Bridge: Outside of the issue Nessel flagged in her opinion [that the bill’s title did not match its contents] a court had already ruled that the Legislature unconstitutionally gave six-year terms to the Corridor Authority board members. That could sound like a very minor flaw in the legislation, but the Constitution very explicitly says terms can’t exceed four years. Is an error like that more evidence of a sloppy process? Shirkey: It was an unfortunate and unintended error that should have been caught. But I do not agree it was due to an effort to get around other obstacles. It’s a complex process to find solutions to get the pipeline off the Straits lake bed, while not disrupting the energy and economy of Michigan. Bridge: After Gov. Snyder quickly appointed the Corridor Authority’s three members, two resigned within days. Do you have any insight into why that happened? Critics have also called that confusion a sign of poor vetting. Shirkey: Anybody can cherry-pick these instances and conclude what you’re proposing [that the state’s process was sloppy]. But I maintain that you always find what you’re looking for. Please use that quote. Bridge: This wasn’t the only bill Democrats complained about not understanding — and not having time to read — in a lame duck session that saw nearly 400 bills sent to the governor’s desk. Is there a problem with the way lame duck functions? Shirkey: Do I wish we had prosecuted this legislation six months or a year earlier? Absolutely. I think the outcome would have been similar. But that’s 20-20 hindsight. Lame duck does create vulnerabilities. I’m not going to deny that. Speaking Monday morning on Frank Beckmann's radio talk show on WJR-AM, House Speaker Lee Chatfield, R-Levering, echoed some Shirkey's critique and called Nessel's legal opinion "laughable." "I want to hear what’s the plan to continue delivering these energy resources with a safe method of transportation," Chatfield said. Shirkey: " I believe voters are always right, regardless of whether I agree with the outcomes or not." Oh... really? Let's talk about how you quickly dismantled the ballot proposals that were soundly approved by the "voters" in the last election. Hypocritical windbag. shirkey and others have soldout to Enbridge. 95% of the crude going thru straits each day (23 million gallons) goes sarnia . When ngls (propane) is being pumped, that jumps to 98%. Shirkey wants to get the 66 year old pipeline off the lakebed. The 201 anchor supports do that by holding the line 2-4 off the lakebed. (stronger than anticipated currents wash out the lakebed from underneath the twin lines.) next anchor drag will thus do much more than just than just dent or gouge as occurred one year ago today) having this vintage line pump during the decade long build is a huge danger. given the lack of benefit to michigan, why should the state continue to help canada gets its oil to the canadian market and export to Europe if there is any risk to pure michigan? Does mike get money from embridge and big oil? "..could result in the state suing itself, ..."
WHO would pay for this lawsuit? Why the Michigan tax payers of course. Not one dime coming out of the pockets of the overpriced politician children who caused this bickering in the first place. People in Lansing please just GROW UP, stop the petty bickering & do something for The People of Michigan. This guy has some real nerve to call other elected officials' actions 'shameful' after the shenanigans he and his party played last year during the lame duck. His comment about believing the voters are always right is clearly not true, either. Adopt and amend ring a bell to anyone? Who was responsible for undercutting the voters then? The pipeline does not need to run through Michigan. It's not our product, we get zero benefit and all the risk. Let Enbridge run it through Canada, since that is where it is going! Linda, A little geography lesson is needed. Unless i'm mistaken Canada is on the other side of the lake. And if that's the case are you assuming that they, Canadians, don't care whether oil is spilled into the lake? Bring on your lawsuits, this pipeline is one dragged anchor away from an environmental disaster for the Great Lakes. Endbridge's safety record with pipelines is what's shameful, our only hope in this state is to vote out the majority GOP Legislature once and for all. The senator and his republican colleagues will be eating “ Shirkey Jerky” made from prime cut of” trump rump” after they are shredded in the 2020 election. "Shirkey is the founder and owner of Orbitform, a leading engineering company ... provides world-class prototype engineering services for assembly of parts and specialized forming and fastening. Mike also worked for General Motors in various management and engineering roles for 13 years. ... Shirkey earned a bachelor’s degree from General Motors Institute (GMI) in 1978 and a master’s degree in mechanical engineering from the University of Wisconsin at Madison in 1979." In other words, his only legal background is what he's gleaned from law-making. Chatfield? He taught high school and coached HS teams. No legal background there, either. Meanwhile we have not one, not two, but three well-respected, highly educated attorneys running the executive branch. "You always find what you’re looking for." Indeed. These issues could benefit from Court directed mediation where all concerns pertinent to line 5 can be voiced in a private yet comprehensive forum. I worry about all these pipelines. Enron has taken michigan to court because they do mot want to be respinsible for cleaning the kalamazoo spill. It still sits at the bottom of thst river.